a pair of scissors and school glue. 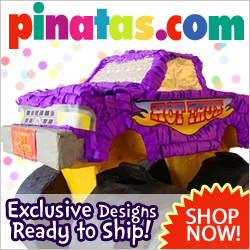 1) Cut a 3″x3″x3″ flap on bottom of pinata, as close to the center as possible. Perforate two small holes in the middle of the flap. 2) From the inside, attach the pinata trap activator to flap, bringing the ribbon outside the pinata. 3) Make sure that the ribbon is left out when you close the flap. Do not secure flap with any tape or adhesive. 4) , Attach each ribbon around the base of the pinata with scotch or masking tape. Pull the ribbon that is hanging out of the trap and bring it to the same level as the other ribbons. 5) Spread school glue over the bottom of the pinata. Apply the tissue paper included in this kit making sure that all ribbons are completely covered. Apply a second layer of tissue around edges of trap and let dry. Ready to play the pull ribbon pinata game! Add fun to the game by attaching a candy or party favor at the end of each pull ribbon – every player is a winner!